Trouble Getting Approved in Colorado? Summary of Colorado Usury Law(s) / Quote: "Legal: 8% Contract: As set out in instrument except as limited by U.C.C. / Judgment: 8% / Corporate: No specific rate"
Legal Maximum Interest Rates: Quote: "8% if there is no agreement (§5-12-101); max interest that may be contracted for is 45% (§5-12-103); interest on consumer loans may not exceed 12% unless made by supervised lender (§5-2-201)"
Usury Penalties: Quote: "Criminal penalty for knowingly exceeding 45%, Class 6 felony (§18-15-104)"
Judgment Interest Rates: Quote: "8% if not specified in contract; if contract rate is variable, then at rate on day of judgment (§5-12-102)"
Legal Exceptions: Quote: "Savings and loans (§11-41-115); mortgages (§5-13-101); business and agricultural loans (§5-13-102); small business loans (§5-13-103)"
Charles and his wife have been commuting to work together for the last couple of years. By driving together, they save a great deal of money on gas and parking. He drops her off at her place of work which is not far from his work location. They both finish about the same time and they ride home together. If one of them has to work extra time, they make arrangements to pick each other up. Charles also has free parking at his place of work. Charles has an opportunity to take a second job. He is excited about making a little extra money, but it would mean that he and his wife can no longer commute to work together. They will need another car and there will be the additional operations cost. Insurance, gas, parking etc. have to be factored into this decision. The new second job could lead to a permanent job at a higher rate of pay, which is really what he is interested in. He has decided to purchase a used vehicle and needs a loan to help him make the purchase. He has $1500 to put towards the purchase and needs another $6500 to cover the remainder, plus registration, safety and a tune up. With a four year term, the monthly costs should be quite affordable. While his wife is not too excited about having to drive to work herself, she is resigned to having to purchase another car if it will lead to another job with more income. Charles asked for a four year term for this car loan. He is going to use the car he purchases as collateral for the loan which will help him qualify for a lower interest rate on his loan. He and his wife also have an average credit score which in this case did not hurt him because of the car being used as collateral. They have a small loan remaining on the other car they have and several credit cards all with a zero balance. They manage their finances well, pay their bills on time and have their home almost paid off. They work hard to make a living and are hoping that this new job will help them get ahead. The car will be registered in both their names and both will be registered drivers for insurance purposes. The loan that Charles will be taking on must be registered in both their names as well, since his wife will also be a registered owner. If for some reason, Charles does not complete all of the payments on the loan, his wife will be expected to resume payments for the remaining car loan payments. This is standard procedure for all loans. 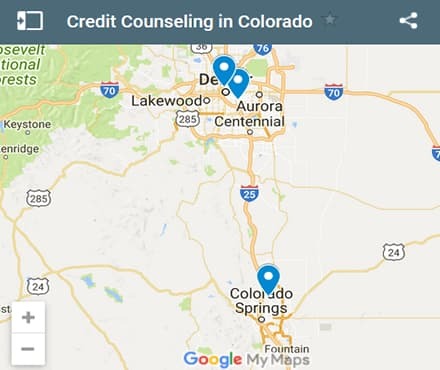 If you live in the State of Colorado and you're struggling with a bad credit rating we hope our website helps you in some way get approved regardless of your FICO number. Last 5 debt service loans approved in the State of Colorado. Source: WFL Lender Pool. Updated Weekly. Principals rounded to the nearest $1000. Relative interest rates listed below in order left to right. 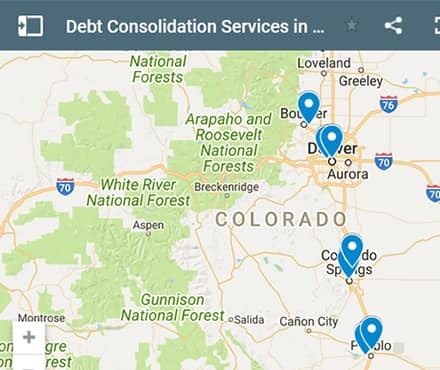 Here is a sample list of providers in the State of Colorado that can help with you with either debt relief, debt consolidation, or debt counseling. More on the City pages. Note to debt service providers: contact us for listing removal. We have included a list of 10 options for Colorado residents if you need to consolidate your debt. It always a good idea to first apply for any consolidation loan with your local bank or credit union branch first. Usually your best chance of approval is with the financial institution you've been doing business with over the last few years. Just something to consider. You can always try other lenders if your own branch declines your loan request. Paula needs to borrow $9300 to consolidate credit card debt and another small loan that she is responsible for. She booked her vacation and charged everything to her credit card along with travel insurance and a few other incidentals. The monthly statement has just arrived and the total amount is due in a few weeks. She does not have the cash to pay for the trip and probably should never have booked it in the first place. But she has done this and there are no refunds. She has several credit cards, however this particular one has a large limit on it. With such a large limit it was easy to charge the trip to the card and worry about how to pay for it later. These large limit credit cards make it easy to charge something. They are expecting that consumers will not be able to pay the entire balance on the due date and that is when the high interest rates are charged. Paula was attracted to this card in the first place for a number of reasons. She collects travel points which can be used to pay for trips etc. It also had a low monthly interest rate charged on any overdue balances and transfers from other cards for the first six months. This is great for transfers provided that you have the funds to pay the balance prior to the end of the six month period. The interest rate really escalated after that. The bottom line is that Paula needs a loan for $9500 at a low interest rate to pay her credit card debt. She would like a four year term for the loan. She never imagined that it would take her four years to pay for this trip! Fortunately for Paula, she has a great credit score, little other debt and a good job that is permanent. She will easily qualify for this loan and it will be deducted monthly from her checking account. The loan is going to cost her $1100 in interest over the four years which is much less than what the credit card company would have charged over the same period. She is a little upset. What this really means for her is that this trip is actually costing her $1100 more than she thought it would. Whenever an item is purchased, whether it is a material item or as in this case a trip, they can get a lot more expensive when interest is factored in. If a consumer cannot pay for the time when the credit card statement arrives, interest will be charged on the overdue balance. That great sale you got which saved you all kinds of money is not such a good deal any longer once you factor in the interest charges on any overdue balance. Paula is learning this particular idea in a big way. $1100 is a lot of additional interest to pay. 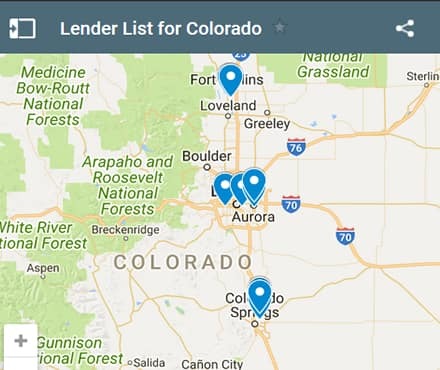 If you live in the State of Colorado and you're trying to get approved for a debt consolidation loan, we hope our website helps you find a good lender and a low interest rate, regardless of your credit score.